Children have an important part to play in missions! We believe it is important for them to develop a passion for missions at an early age. 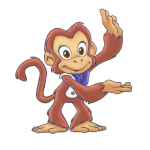 Each month through the Engage Kids activity booklet, children will join special characters and Louie the monkey on a fun, interactive missions journey of their own. The booklet contains activities and stories which help children learn about the current region being discussed. They will even be given opportunities to interact with missionary kids their own age. Engage Kids is fun and exciting—intentionally geared towards children ages six to twelve. Your kids will love this program! The Engage Kids booklet is an excellent tool for parents to use in family worship, to help Sunday School teachers spark interest in missions, or for Christian Day School teachers who want to awaken in their students a desire to be more involved in missions. Engage Kids is a part of the Engage Church Missions Program. To learn more about this program, click here.